Business in the front and party in the back. Hugh Jackman takes on a mullet and a different role than usual in the sci-fi flick Chappie, a movie about a robot created for the purpose of serving and protecting the police in South Africa. The main creator of all these robots is Deon Wilson (Dev Patel) who makes a program to give the robots enhanced artificial intelligence even though he's told not to. Hugh Jackman's character is a jealous scientist and will do anything to sabotage Deons's robots to make his creation the first choice of their company. Instead, Deon goes behind everyone's backs and decides to take one damaged robot called Chappie to test out his new AI. At first, Chappie acts like a little kid and doesn't know what's going on but throughout the film he learns at a super fast pace. 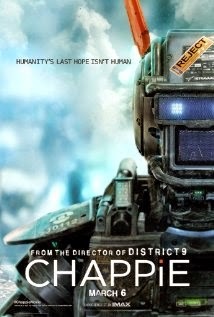 Chappie is super impressionable. If he's around good people he picks up mannerisms from them and the opposite is true for bad habits as well. He has his own judgement and decides what to retain, which luckily means he doesn't harm others. Chappie goes through trials and is treated different from humans because everyone else sees him as a robot cop but that isn't all he is. You feel bad for him at times and would take his side over the humans The movie is a great sci-fi film from the director of District 9 and doesn't disappoint. The movie revolved around things like racism and acceptance of things out of the ordinary but is also an action film.